Despite sounding like an off-brand breakfast cereal, the genetic engineering technique CRISPR has infiltrated the vocabulary of the general public, stoking fierce ethics debates, imaginative renderings of the future and even inspiring a novel and a J.Lo-backed TV series. That’s because CRISPR truly is amazing, allowing human beings to alter genetic code with a level of precision never before achieved. And now there’s actual video footage documenting just how amazing CRISPR really is. Scientists have already accomplished the incredible with CRISPR, from making allergy-free gluten to editing a human embryo. But, as often is the case in science, the nitty gritty details of exactly how CRISPR works has been a bit of a mystery. Now, a new paper published in Nature Communications Friday provides real-time, molecule-scale footage of CRISPR cleaving a strand of DNA in two. 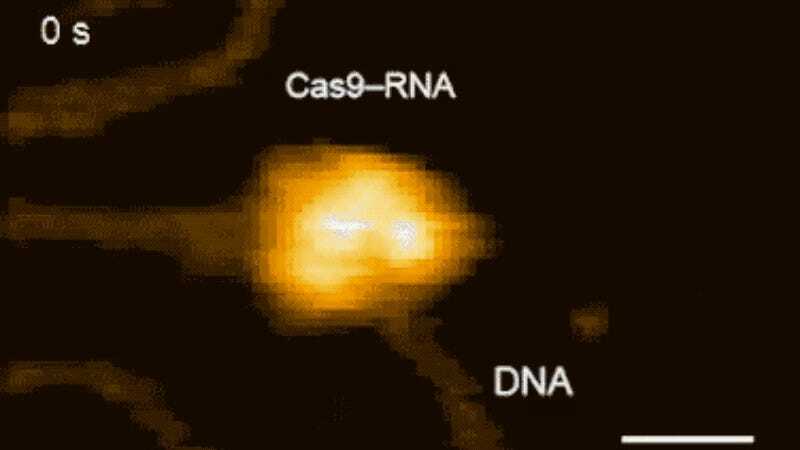 The video is grainy and dark, but it provides an astonishing first look at CRISPR in action. A team from Kanazawa University and University of Tokyo in Japan used a technique called high-speed atomic-force microscopy to capture the shape of Cas9, the enzyme that actually does the cutting. A tiny needle moves back and forth, rendering details about the enzyme’s shape, moving so quickly that it produces a moving image. The video took the science world by storm over the weekend, racking up more than 1,500 retweets and thousands of likes. CRISPR is definitely a pop star of the science world—and we’ve only begun to scratch the surface of its potential.